Eros International and producer Viki Rajani's action entertainer R...RAJKUMAR, directed by Prabhu Dheva, starring Shahid Kapoor and Sonakshi Sinha will be attached to Abhinav Kashyap's BESHARAM. The high-octane entertainer is a romantic-action-love story set in a dusty and rugged backdrop of the Hindi Heartland. With cool visuals, fresh and crazy Prabhu-ishtyle action, R...RAJKUMAR treats audiences to an entire different perspective of life. After several discussions between Prabhu Dheva and the makers of BESHARAM, the trailer of R...RAJKUMAR will now be attached to the Ranbir Kapoor starrer, a treat to all the fans of the Gen-X stars. Confirming the news says producer Viki Rajani, NextGen Films 'Prabhu had a meeting with the producers of Ranbir's film and they agreed'. 'R...RAJKUMAR is a complete entertainer, the kind that will appeal to both single screen and multiplex audiences.We look forward to everyone's reaction on the trailer,' says producer Sunil Lulla, Eros International. 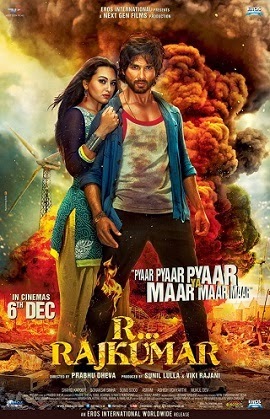 Eros International and NextGen Films' R...RAJKUMAR directed by Prabhu Dheva stars Shahid Kapoor and Sonakshi Sinha, is scheduled to release on 6thDecember 2013.